308 Winchester is one of the best long range hunting rounds in America. 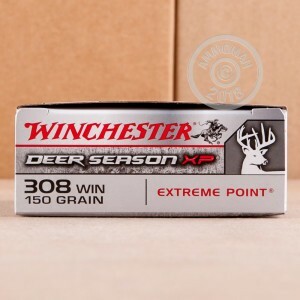 With a distance capability equal to a sniper rifle and with considerable power, not to mention their polymer tips, these 308 Winchester rounds are great for deer and elk hunting. The polymer tip on these rounds is oversized, which has an effect of increasing the size and speed of expansion, causing devastating effects. 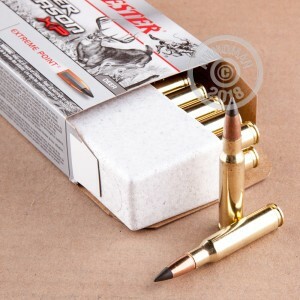 These rounds have brass cases and Boxer primers too, making them reloadable. Pick up a 20 round box today! 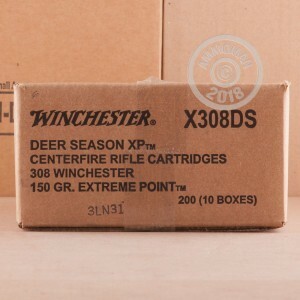 The Winchester deer season XP is excellent! ! Performance and accuracy was outstanding out of my g2 recon 308. AMMOMAN can't be beat!